These Peanut Butter and Banana Egg Rolls are a delicious, fun treat that everyone is sure to love! Ever since the first time I made my Bacon, Egg, and Cheese Breakfast Egg Rolls, the wheels in my brain have been spinning to come up with other fun, unique, and delicious egg roll variations! The first variation on my list are these Peanut Butter and Banana Egg Rolls! I decided to fill the egg roll wrappers with ingredients inspired by my favorite panini – peanut butter, bananas, honey, and cinnamon! While they are amazingly delicious on their own, I also included a couple ways to fancy them up a bit at the bottom of this post! Before you start making the egg rolls, make sure your deep fryer is on and set to preheat to 350 degrees. Have a plate lined with paper towels out and ready for you to empty the cooked egg rolls onto as well. Set out all the ingredients, including a bowl of water and a silicone brush, any powdered sugar, chocolate sauce, and/or ice cream you plan to serve on the side. Peel and slice the bananas in half and lay out the egg roll wrappers. To make the egg rolls, spread about a Tablespoon of peanut butter onto each egg roll wrapper. Top the peanut butter with the bananas, then sprinkle on the cinnamon. Drizzle the honey over everything, wrap, and place into your deep fryer basket. Deep fry the egg rolls for about 2 minutes or until golden brown. Be sure to let the egg rolls cool some before biting into one! They get really hot inside! 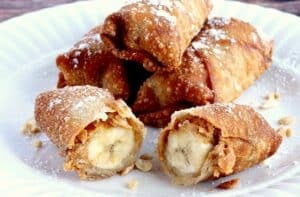 While these Peanut Butter and Banana Egg Rolls are amazing on their own, there are a couple fun ways to turn them into a “fancy” dessert as well! First, you can stack them onto a plate, sprinkle them with powdered sugar and set them out to serve. You can enjoy these with or without vanilla ice cream. 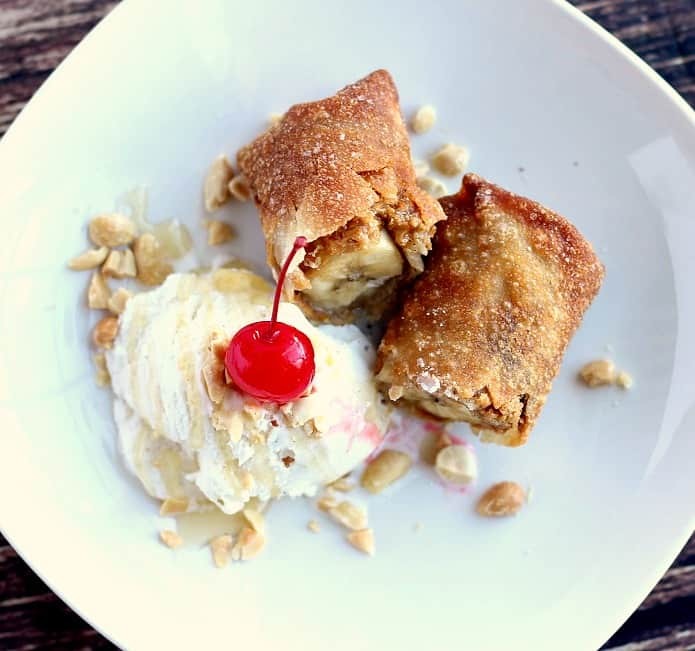 Second, you can make a Peanut Butter and Banana Egg Rolls Ice Cream Sundae! Place one or two egg rolls on a plate alongside a scoop of vanilla ice cream. Drizzle with honey (or hot fudge) and top with chopped peanuts! 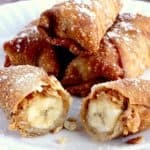 I’m sure there are a ton of other ways to enjoy these Peanut Butter and Banana Egg Rolls! If you have other suggestions, I would love to hear them! PREP: preheat your deep fryer to 350 degrees F. Line a plate with paper towels and set aside. Peel and cut the bananas in half. Have a bowl of water and a silicone brush out, as well as the peanut butter, honey, and cinnamon. Lay out the 4 egg rolls wrappers with one corner pointed towards you. Spread one Tablespoon of peanut butter onto the center of each wrapper. Lay a half of banana over the peanut butter. Drizzle each banana with a teaspoon of honey and add a pinch of cinnamon. Wet the edges of the egg roll wrappers with the water. Fold the bottom corner of the egg roll wrapper up over the filling, then fold in the left and right sides, roll and seal the top corner. Add the egg rolls to the deep fryer basket and cook for approximately 2 minutes until golden brown. Let cool some before serving. Looks awesome, quick question are the bananas still a little firm? I have an oddball when it comes to texture. I think they look amazing though and can’t wait to test out the recipe. Peanut butter and banana is one of my favorite flavor combinations! Making these ASAP! YUM! Oh my, these look so good and so simple to make! Love this idea. These would be perfect for a quick and easy dessert. Super, super-fun idea! I just love the looks of these and can imagine the combo of crunchy and soft banana! Well done! These look and sound absolutely SCRUMPTIOUS! I can’t wait to try! Thanks for the fabulous idea! Scrumptious is my 9-year-old’s favorite word to describe just about everything! I love it! Thanks for stopping by! These egg rolls are so fun. Such a great dessert. And they seem really easy to make! Thanks Erica – they are SUPER easy! I love this idea! The combo of peanut butter and banana is brilliant – plus they are fried! This screams “Yum”! Thanks for the recipe. I’m so pinning this for later. Looks delicious! These sound wonderful! Crunchy on the outside and soft on the inside – Yum! I make a similar dessert using rice paper wrappers to keep them vegan and gluten free. Great idea! I haven’t seen rice paper wrappers where I shop, but I want to try them soon! Oh my goodness, this looks tasty. I cant want to try this. Thank you Sue! Hope you love them! woah, these look absolutely incredible! You had be sold with the fried dough and stuffed bananas! These look SO GOOD!! My friend’s having a dessert party soon where everyone brings a homemade dessert, this is going to be my contribution!! Thanks for this! A dessert party sounds so fun! Hope everyone loves them! Wow. I normally skip right over recipe posts because I know I’ll never actually make the things that look so yummy. But I HAD to look at this because these look amazing and I really want to make them. Thank you! Thanks so much Jolina! We love plantains too so I’m going to have to look into turon! This wold be a fun treat to make and try out. Love the combination. Wouldn’t want it to often but every once in a while. I’m drooling!!! Love this idea and it’s such a simple recipe!